Manshu Yang is a psychometrician and social and health services research methodologist whose experience spans the design and evaluation of psychometrically-based measurement tools for health outcome and healthcare quality, the experimental design and evaluation of health programs, the design of sampling strategy and data collection procedures, as well as conducting statistical analyses using complex, state-of-the-art techniques. 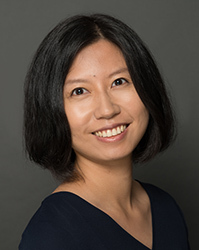 Dr. Yang is involved in survey development, program evaluation, and data analysis for projects related to patient-centered outcomes, health care quality and performance measurement, and healthcare reform. She collaboratively developed a scoring system based on Item Response Theory and a software administration system which uses Computerized Adaptive Testing for the Adult Sickle Cell Quality of Life Measurement System. She led the psychometric analysis to evaluate the reliability and validity of the Consumer-Based Cancer Care Value Index survey. As one of the leading analysts on the Agency for Healthcare Research and Quality Effective Health Care Program Community Forum project, she designed the sampling strategy, developed an innovative randomization process, and conducted statistical analyses for a large-scale five-arm randomized controlled experiment to evaluate the effectiveness of public deliberation in obtaining informed input about use of evidence in healthcare decision-making. As a native Chinese speaker, Dr. Yang is currently leading the Chinese linguistic translation of two surveys to measure experiences with the recently created Health Insurance Marketplaces and Qualified Health Plans under the Affordable Care Act. Dr. Yang has authored a number of technical reports, professional presentations, and journal articles. She has managed and led project tasks for the Agency for Healthcare Research and Quality; Centers for Disease Control and Prevention; Centers for Medicare & Medicaid Services; the National Institutes for Health; the National Heart, Lung and Blood Institute; and the National Patient Advocate Foundation.